A question many aerial installers in Croydon get quite often has to do with whether purchasing a curved TV is a good idea. This makes sense, since even though curved TVs are no longer new, they are still quite unique and interesting, making many people consider getting one for themselves. Well, is it a good idea, or is it just a waste of money? Let’s explore this question together. This one is by far the most often-used argument for curved TVs, and it has to do with the fact that by curving the screen, the image in front of you wraps itself around you, much like it happens in real life, where your peripheral vision is better engaged than when watching a normal TV. As such, a curved TV is meant to get you more involved with the world it is bringing alive in front of you. On the other hand, in your living room, chances are that you’ve got quite a few windows bringing in natural light. This is something a TV store does not. You may be wondering what does that have to do with anything, but think about it. Light hitting the screen of a normal TV can impact your viewing experience quite a bit. On a curved TV, on the other hand, the light gets distorted, impacting your experience even more. Of course, this isn’t something you’ll likely be able to get a sense of in the store since there is usually no natural light there. As such, if you’ve got quite a few windows in your living room, perhaps a curved TV may not be the best option for you. When the edges of the image on a TV are bent, the impression is that the screen stretches further than the same sized regular screen would. As such, you’re left with better viewing experience. While it is true that a curved TV may create a better sense of immersion, and give you a better depth, in order to actually enjoy these benefits, you should be sitting right in front of the center of the screen. Of course, this isn’t necessarily that big of a deal, since if you have a large enough screen, several people can fit in the middle. Curved screens are used in cinemas because it helps create a viewing experience that is uniform, regardless of where you happen to be looking on the screen. Indeed, the curve seems to work to help the image keep its sharpness even when we’re talking about the corners of the screens. Since we’ve spoken about cinemas, we also have to mention something that is likely going to be a con for a regular TV-seeking individual: in order for you to enjoy the benefits of a curved TV, the screen has to be large. Well, if you think about the screen of a cinema, you’ll likely understand what we’re talking about. It seems that with 55-inch screens, the benefits associated with a curved image are almost not there at all. It’s only from the 65-inch point and up that starts to happen. 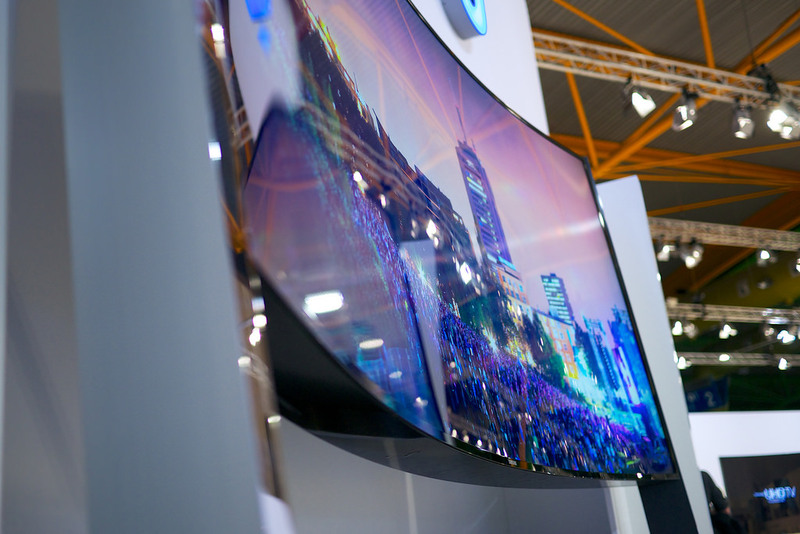 If you’re considering purchasing a curved TV, we hope this article proved to be of some help. By and large, it seems like they’re just not worth the investment in most cases. Of course, in some, they are, and especially when you’re able to purchase and find enough room for a huge screen. Otherwise, you’re likely better off with a regular screen.